In 1938 Frank Lloyd Wight was entering the most productive period of his life and, once again, was in the media spotlight. Open to the public and available for rent. 1938 found The Architectural Forum devoting an entire issue to his work, Time Magazine ran a cover story entitled Usonian Architect, the Johnson Wax Administration Building was under construction and the recently completed Falling Water was being celebrated internationally. Edgar Kaufmann, already a close friend of Frank Lloyd Wright, was an enthusiastic advocate of Wright’s Usonian ideas. Kaufmann was already considering the idea of building a version of the Jacob’s House inside his department store in Pittsburgh when Life Magazine, in collaboration with The Architectural Forum, invited Wright to participate in an article called “Eight Houses for Modern Living”. Life commissioned designs of a “Dream House” for four typical American families with incomes ranging from $2,000 to $10,000 a year; a traditional and modern architect assigned to each family. In Wisconsin, Bernard Schwartz, a Two Rivers Business Man, was ready to build a house for his family and gave Wright the opportunity to build his Life Magazine “Dream House”. Bernard and Fern Schwartz made a trip to Taliesin where Frank Lloyd Wright, eager to see the Life Magazine scheme built, was happy to fulfill their dream of owning a Wright designed house. Frank Lloyd Wright modified the Life Magazine plans changing the materials from stucco and stone to red tidewater cypress board and batten and red brick. He went on to refine the design by pushing up the ceiling in the living area making room for a stunning second floor balcony overlooking the sixty-five foot long, aptly named, recreation room. Wright went on to design tables, chairs, hassocks, beds, fruit bowls, lamps and a couch with built-in bookshelves. Pleased with the completed Schwartz Residence, that he had called Still Bend, Wright went on to design numerous additions including: an expanded utility room to accommodate a wood shop, extensive landscaping plans, a pergola leading from the house to a small farm unit and an elaborate boat house to be built on the East Twin Rivers below the house. Unfortunately none of these plans where executed. Bernard and Fern loved their new house and raised their son Steven there. In 1971 the Schwartz Family sold their beloved home to the second owner who lived in the house for thirty-three years raising five children in the Home.Today the house is owned by brothers Gary and Michael Ditmer and is being lovingly restored, cared for and being made available to the public. 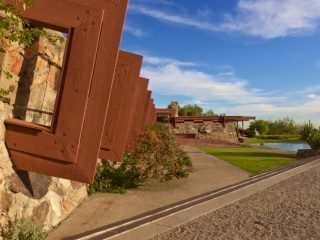 Still Bend offers public tours, educational programs and is also available for overnight rental so that people may experience the magic of living in a Frank Lloyd Wright designed masterpiece, if only for a few days.